Hive audit tools provided by DataSunrise are designed to monitor and keep track of every change made to the database. Audit results of activity and performance monitoring provide an extra security measure and forensic evidence in case of cybersecurity incidents. Use DataSunrise to audit Hive databases and comply with regulatory demands (GBLA, SOX, HIPAA, PCI DSS). 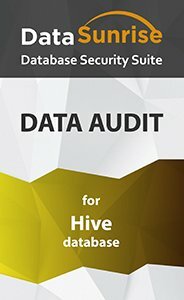 Hive audit solution by DataSunrise allows monitoring and capturing of database events from different nodes on your network. It doesn’t require hardware appliances or even software-based agents. Detailed audit logs contain data on database changes (client IP address, host, used application, code of SQL query, database, table, affected rows, date, time, etc.). After the deployment, you can configure self-learning mode with help of learning rules. DataSunrise tracks every transaction and generates a list of SQL queries typical for the given environment. Hive audit software is easy to deploy. Scalable rule settings and user-friendly GUI are designed to automate essential security procedures. Create stand-alone rules to detect unauthorized access attempts, SQL injections, or requests for sensitive data and receive notifications whenever the rule is triggered. Properly configured security and audit policies save database administrators a lot of time. DataSunrise performs monitoring and logging of transactions with minimal impact on database and application performance. Hive audit reports also contain different configuration changes. With DataSunrise you know who has changed certain security or audit policy and detailed session information of each user. Audit results are stored in external databases, making it impossible for evildoers to eliminate the traces of malicious activity. Integration with SIEM systems provides real-time analysis of security threats. Use Hive audit tools by DataSunrise to mitigate risks of excessive privilege and legitimate privilege abuse, unmanaged sensitive data and SQL injection attacks. Regular monitoring of logs helps to detect potential vulnerabilities and signs of preparation for a targeted attack.